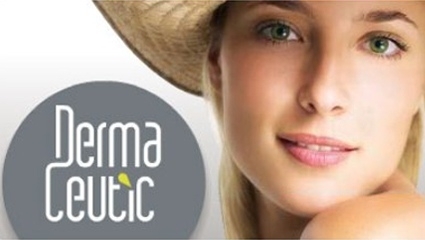 Dermaceutic is a full range of cosmeceuticals from France to prepare, optimise and maintain the results of aesthetic procedures involving the skin. The Wembley Clinic is introducing only 4 products in their range due to their ease at which it can be accompanied into your other regimes. Dermaceutic Hyal Ceutic. Corrects deterioration in the properties of the dermis and in particular the reduction in hyaluronic acid. High moisturiser weight, so has excellent protective and hygroscopic capacity. It is excellent for dry and ageing skin and is applied to the face & neck. Active Ingredients: Aloe vera 10%, Hyaluronic acid 5.5%, Shea butter 4%, Jojoba oil 2.5% and Vitamin E.
Dermaceutic K Ceutic SPF40 is a tissue repair cream that restores the skin microcirculation in order to minimize oedema & erythema – (redness of the skin). K Ceutic protects & nourishes simultaneously. It stimulates the recovery process through its moisturizing & calming effects as well as the solar protection. Dermatologically proven, zero index of irritation. Rub in uniformly until completely absorbed. Repeat the application after prolonged exposure. Active Ingredients: Microdispersed mineral sunscreen – titanium dioxide 10%, Chemical sunscreens – phenethyl benzoate 10%, octocrylene 6.5%, 3-benzophenone 6.5%, octyl methoxycinnamate 5%, Calendula extract 3%, Wheatgerm oil 2%. Dermaceutic Serum C25 contributes to slow down the epidermis aging process caused by sunlight and pollution: it prevents the loss of skin tone, elasticity & irregular complexion. It is an ideal make-up base. Serum C25 effectively controls free radicals.Factors triggering wrinkles & dark spots are therefore regulated & inhibited. Methyisilanol ascorbate (stable vitamin C derivative) protects collagen fibres from oxidative stress & maintains skin moisture levels. Apply every morning on the face, neck & around the eyes. Active Ingredients include: Methylsilanol ascorbate 25%, Vitamins A, E, B, B5, Polyphenols. 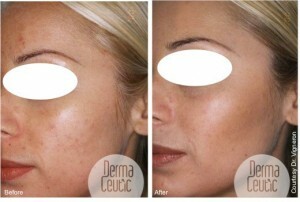 Dermaceutic TurnOver slows down skin aging process by stimulating natural skin turnover, collagen & elastin synthesis. Glycolic acid elmiminates cell residues & dead cells from the surface of the skin & imparts a soft, rejuvenated appearance. Suited for all skin types, & recommended for aesthetic treatments preparation or skin rejuvenation programs. Directions: Apply in the evening a thin layer on the face & neck. Reduce frequency of use if skin is not used to glycolic acid. Mild tickle feeling might occur on very sensitive skins. Use Serum C25 for complete skin care treatment & SunCeutic for sun protection. Cleanser 5 can be used to improve results.Active Ingredients: Glycolic acid 15%. Results are amazing, the proof is in the pudding.